This week, again, the bulk of the action in Guardians of the Galaxy (GOTG) space has been raided by Goonswarm Federation’s (GSF) black ops SIG (Special Interest Group), which has been very aggressive against Northern Rorquals in the US timezone. They had undoubtedly been riding high coming after killing five DARKNESS titans left vulnerable due to a series of tactical errors. One can hardly fault the GSF raiding squads for feeling invincible, indeed, amoung their follow up successes can be counted a Hel which went down on the 28th. It seemed to be shaping up to be a successful week of hunting for the GSF. 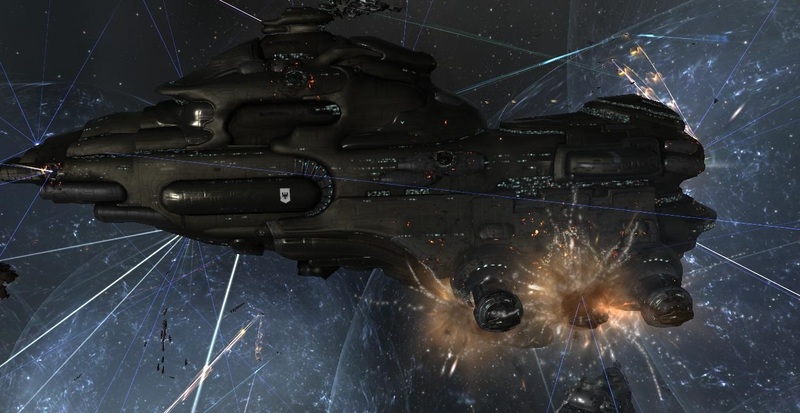 On the 29th of March, one rorqual from SLYCE alliance went down. Surely, this was a sign of the crumbling resistance and eroded morale that the GSF pilots’ overlords had promised them! They could just freely use their dreads and drop carriers with no need to worry about a response, right? Well, thought the local leadership. Why not offer them another? Rorqual Pilot Kristy LaForge and titan pilot SomeoneStrange , stepped up to show that the North will not take such treatment lying down. Apparently, the bait rorqual did not get a cyno beacon lit which would have allowed instant capital reinforcements, raising the possibility of a second capital loss. Despite knowing there was a cynosural inhibitor on the grid (that’s an anchorable structure that prevents vessels from jumping in directly to a beacon), Strange stepped up and volunteered to take his Titan into the fray, knowing full well he was in for dangerous ride. Advised by the FC, Riotrick, that if he could kill that inhibitor, then the Goon’s dread bomb could be quickly wiped out, he replied. Receiving the green light to proceed, Strange succeeded in killing the inhibitor, which opened the chain of reinforcements on both sides. Initially, the GOTG side brought in just 3 Force-Auxiliary carriers to rep the capitals already deployed, in a bid to entice the GSF to commit more dreads and carriers, as there was a mere handful on the grid at the time. Scouts in ROIR-Y were providing real-time intel regarding what the GSF was undocking to reinforce. Once over dozen capitals were confirmed to be in siege mode, that’s when the trap was sprung. GOTG and a “small gang” of NC dropped the hammer with dozens of Supercarriers and Titans to whore in on some dread kills; I mean participate in “defensive support operations.” Whereupon the engagement was pretty much reminiscent of the latter stages of last week’s massive battle in ROIR-Y, grinding through the immobile dreadnoughts hitpoints until none were left on the field. SLYCE just celebrated its three years anniversary in null, so we are very young and cognizant that we don’t have the financial or organizational depth as Goonswarm, TNT, LAWN, INIT, Snuff, and Bastion combined. But we do have neighbors and allies (NCDOT, G0TG) that was kind enough to help our small, and fragile industrial alliance. Right here is the right site for everyone who hopes to find out about this topic. You understand a whole lot its almost hard to argue with you (not that I personally would want to匟aHa). You certainly put a new spin on a subject which has been written about for ages. Wonderful stuff, just great! yourself? Either way keep up the nice high quality writing, it’s uncommon to peer a great weblog like this one today.. I visit day-to-day a few blogs and information sites to read articles, but this webpage presents quality based posts. 2efmb2 You made some good points there. I looked on the net for more info about the issue and found most people will go along with your views on this web site. What’s up, its fastidious piece of writing concerning media print, we all be aware of media is a great source of facts.